Raw sewage is extremely dangerous, so perhaps instead of loving it as our title suggest it’s best to fear and respect its power. Raw sewage is a biohazard, and it must be handled properly to keep people safe. Let us, the fine folks at 911 Restoration Fort Worth, walk you through a Q&A so you know what to do should the unthinkable happen. Because knowledge is power. Raw sewage, commonly referred to as black water, is wastewater that hasn’t been treated yet. Its origin can be either residential or commercial properties. It can also result from agricultural processes as well. It contains contaminants including bacteria and other harmful substances. What are the classifications of sewage water? Raw sewage consists of human waste. Commercial waste consists of liquids and waste coming from restaurants and other establishments. Commercial waste is sometimes considered sanitary sewage. Surface runoff consists of storm or overland flow and usually occurs after heavy rainfall occurs. Treated sewage is sewage that can be classified into three different grades: A, B and C. Untreated sewage refers to wastewater that has not yet passed through any treatment system. Untreated sewage is contained in a waterway or an onboarding holding tank. How do sewer backups occur? Sewer backups occur in the home primarily from toilet overflow. Flushing too much paper or material that shouldn’t be in the toilet to begin with can cause a really problem for the rider of the porcelain bus. Heavy rains that flood municipal sewers can cause backups in residential home as well. Installing a sewage back flow valve is an excellent precaution to take and will help get waste moving in the right directions in your plumbing. Microorganisms can enter the system in one of several ways. Individuals can inhale the substance. They can enter the bloodstream with direct exposure with an open cut or through the skin’s surface. Hand to mouth is the most common way people come into contact with the dangerous substance. Exposure to bacteria and parasites can lead to severe health issues. Bacteria found in water can lead to gastroenteritis, arthritis, diarrhea, nausea, vomiting and other intestinal problems. Parasites can lead to many of the same issues like diarrhea, weight loss, intestinal issues and severe dehydration. Conditions like Norwalk virus or HPV (human papillomavirus) can result from exposure to raw sewage. Take it from us – none of this is a party. 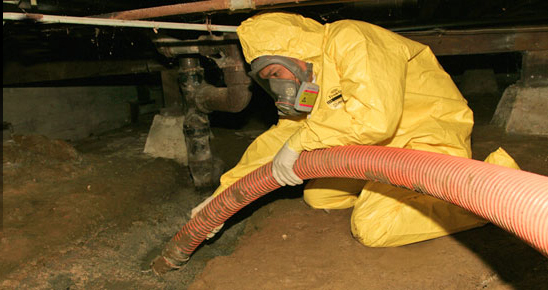 What kinds of protective measures do professionals take when dealing with raw sewage? When handling raw sewage, having the appropriate protective gear is necessary. This prevents cross-contamination from occurring and it protects against certain illnesses that can be introduced when one comes in contact with raw sewage. For minor spills, lime and water can be used to treat the affected area. If personally handling raw sewage, hands should be thoroughly washed after treatment. Most experts recommend that professional sewage backup cleanup services be used the moment the problem occurs for safety reasons. Preventing cross-contamination and proper handling methods require a degree of expertise, and a water extraction from a good water damage restoration company is generally necessary. Whenever there is the slightest hint of a problem with sewage, experts should be contacted immediately to properly contain the situation. Stay safe!